The Office of Information Technology develops and implements the Service’s technology plan; maintains computer applications, and systems; and provides technology support to all aspects of the agency’s operations. The director provides strategic advice and direction with respect to technology issues and trends and ensures continuity of agency information services operations under a variety of likely scenarios. Doug Jones is the Director of Information Technology and CIO at the Federal Mediation and Conciliation Service (FMCS). 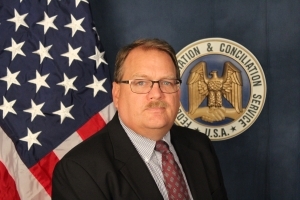 In this role he supervises all IT staff and coordinates all technology and telecommunications services at the FMCS. Doug is responsible for formulating, developing and enforcing policies that govern the agency’s information technology infrastructure, and the use thereof, and guides the agency strategic plan to focus on technology developments and needs as they evolve. Doug joined FMCS in March of 2004 as an Information Technology Specialist. He was initially responsible for all areas of the Case and Contact Management System (CCMS). This included two iterations of system development, rollout, customer training, reporting, administration, and assistance to staff at all levels. He has provided service-wide support for network, software, computer configuration, and remote access for both the national office and the field staff. In January, 2010 Doug was promoted to Director Information Technology. Prior to joining FMCS, Doug was a Strategic Technology Analyst with the National Geographic Society where he led a team in implementing and administering their Storage Area Network (SAN). From 1996 until 2000, he served as Senior Network Consultant with Blue Cross and Blue Shield Association supporting the BCBSA network serving as the Firewall Manager, Enterprise Backup Manager and overseeing the IT help desk in the Washington, DC based Federal Employee Program office. Doug received a Bachelor of Science Degree in Finance from Virginia Tech in 1985. He earned a Microsoft Certified Systems Engineer certification in 1997.